My cat Nora is a spirit cat. Does this mean that she has mythical powers or that she brings me good luck? No, nothing like that. A spirit cat is a cat that is exceptionally shy. Spirit cats are usually under socialized, meaning they have not had enough human contact and are not used to being handled and touched. They are usually rescues that are found as “older” kittens, 6 months to a year old, in either hoarding situations or living outside. Unlike cats that are feral, which do not do well indoors and are considered “unadoptable”, these spirit cats will actually thrive indoors when they are placed in the right home. Spirit cats do not do well in homes with young children. Noise and commotion will quickly send a spirit cat into hiding. This type of environment is stressful for the cat and life is not fun for the cat when most of its time is spent cowering under a bed. Children will not enjoy a cat that runs away when they try to play with it, and spirit cats do not do well in homes where they feel scared and are being chased all the time. Spirit cats do much better in quieter homes. Spirit cats prefer to come to you, rather than the other way around. They will approach you on their own terms, most likely when you are watching television or sleeping, when all is quiet and they feel safe. They may allow you to pet them, or they may to prefer to just be near you or around you. That being said, these spirit cats will usually form a strong bond with one or two people in your household. They will come out when their special person is around, but be virtually invisible when you have visitors. These cats are not “mean” cats, and they do not bite or scratch or show aggression. They are much more likely to run away and hide than scratch or attack when frightened. Spirit cats are unique in that they almost always get along with other cats. They prefer cats to people in most instances, and will usually thrive in households with other cats. 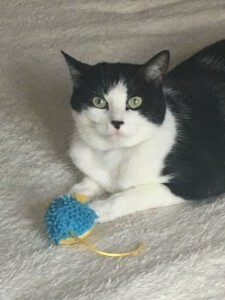 They will engage in play if they see other cats having fun first, and they can often be seen lying next to their cat friends and mimicking their behavior. They make great companions for other cats in the home. So why would anyone adopt this type of cat? Spirit cats are typically adopted by kind hearted individuals with cats of their own who are either looking to give a shy cat a good home or to find a friend for their own cats. These shy cats can linger in shelters or in foster care, and they are often overlooked by potential adopters who are looking for sweet, playful kittens or for the quintessential lap cat. Spirit cats are great for busy people that want to provide a home for a needy animal, but do not have a lot of time to devote to their pets. These spirit cats are very independent and will seek you out when they are comfortable, but for the most part they prefer to hang with their animal friends. Spirit cats aren’t for everyone, but they can make wonderful pets in the right circumstances. Author: Robin Desmet, Rph and MSPCA volunteer. The Valley Patriot is a free monthly print newspaper serving Northern Massachusetts, and Southern New Hampshire. The print edition is published by the 10th of each month and is distributed to 51 cities and towns.